The best struts I have owned. 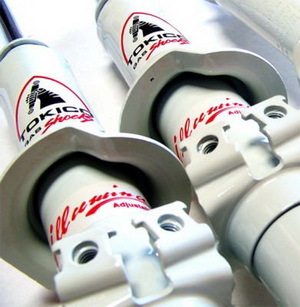 Gives a dream ride along with the Eibach prokit springs. I must mention one problem I had with these struts, and I am sure it may have happened to others as well though they may not realize it. The first few days with the adjuster at 3, the struts were tight as a drum ! Superb ride, great control and little to no body roll. However slowly over the next week or so I felt the struts losing their tightness. I moved the settings up a couple of notches but made little to no difference. The strut felt soft and especially bad was the rebound damping. Even though it could take bumps fairly well, after the bump the front would bounce right back up. Most non-enthusiast drivers probably wouldn’t even notice, but it was pretty unsettling to me. Tried a number of things– removed the struts myself, changed the strut mounts, gave them the struts a good shake (!!)..nothing. Called Tokico , they said they would exchange it with a new pair of fronts (the rears were ok). And then– I did something yesterday I hadn’t done before. Put the screwdriver on the adjusting screw and turned it rapidly several times backwards and forwards. VOILA !! Struts are like new again , tight as a drum. I am very happy, I have decided against returning them for now. If it becomes a recurring problem then I will reconsider. So here is the lesson- if the struts feel they are going soft give the adjuster a few quick turns, forwards and backwards. If there is a valve misalignment inside that should take care of it. Nice and tight. Adjustable. Complex damping characteristic gives a smooth and controlled ride. Some units may have valve alignment problems. Try suggested method above, or exchange them under warranty. Either way its worth it. KYBs — S U C K. Got the non adjustable ones. One of them wore out in 6 months! Review: Top Gear USA – Big bang or dud?